Leaving much of that, er, loaded statement aside (and yes, as a definitive study of one, I do plan to leave my body to science) think of all the money I've spent staying massively stoned since I was fourteen. At approximately $20 a day over 365 days per annum ($7300) for 39 years that comes to $284,700 but do consider that I had to make nearly twice that and pay tax on that income before I could spend it on herb. Money doesn't grow on trees, of course, but there was a time not all that long ago when an ounce of pot and an ounce of gold were the exact same price, for a little perspective. I kid myself that all my money was spent on books and records, but I know the truth. And the truth is, I have no regrets. Frankly I cannot imagine what my life would have been like without marijuana nor do I wish to try. It seems obvious in retrospect that I was, and am, self-medicating, but who cares about that? I simply don't feel right until I've smoked around ten bong hits and I have always been this way since the very first time that I smoked pot. But again, add up all the money I've spent each and every day since 1979 and it only makes sense that with legalization I would want to start growing my own. Now I've been around quite a few grow rooms--some really sophisticated ones--and I have good friends who are master growers, but I myself have never grown anything, not even tomatoes, let alone cannabis plants that resemble Venus Fly Traps. Nevertheless my enthusiasm--I'm finally going to grow pot! !--was not to be dampened by my utter cluelessness as to what the task at hand actually called for. Standing in my new home I announced to two friends that I was going to start growing pot and they started pelting me with annoyingly reasonable questions. Questions that I could not answer. Questions like "Where are you going to do it?" "In the garage. Or the attic." "You can't do that. You'll get spider mites." "You know you'll need a grow tent, right?" If you are reading this because you are interested in growing pot yourself, you probably feel vicariously defeated by what you just read. Admit it, you sighed at the thought of it: It already sounds harder than buying a clone at a dispensary, putting it under a light and giving it a squirt of Miracle Gro several times a day, doesn't it? I felt like an overeager dummy. I also realized in that very moment how it was already seeming like an overwhelming task to me. The next day I read several "how to grow pot" blog posts and the advice was, to say the least, all over the place and often contradicted the thing I'd read right before it. Something I also noticed immediately is that Home Depot's online presence might be the single best and biggest internet source of all things hydroponic. But unlike the topic of LED lighting, with no clear grower consensus in grow tents or nutrients, I was again overwhelmed. How was I even gonna hang a Black Dog light in my (theoretical) grow tent anyway? Did I mention that I've never grown any plant? I did. Well I'm also helpless with a hammer and tools and so forth. I have no talent in that area whatsoever. I've been an apartment dweller for most of my life. So the idea of making a grow tent and hanging the lights and doing all that made this seem like it was going to be less fun than putting together an Ikea dresser. It was seriously daunting. You think it's going to be easy, but when you want to get off the dime, you could go in a bewildering number of directions and it's difficult to be confident that you're not going to waste a lot of money experimenting until you get it right. That's the way it was quickly shaping up to me. Fortunately I have some human resources to rely on. I emailed my old friend Michael Backes, an internationally known expert on cannabis and the author of Cannabis Pharmacy: The Practical Guide to Medical Marijuana. I explained my dilemma and he gave me several pieces of good advice. First he suggested that I purchase and read (and reread and then reread again) Jorge Cervantes' Cannabis Encyclopedia. He also sent me a PDF of a study about pot growing hygiene which made a very strong case for using hydrogen peroxide to fastidiously clean all surfaces in your growing area. When I expressed exasperation about how complicated the supposedly simple act of growing a weed (properly) was shaping up to be, he suggested that he knew a consultant who was adept at setting up grow rooms large and small and that he'd probably charge me $4000 plus equipment and expenses to set me up right. When I informed him that I didn't see myself ever growing more than six plants, he sent me a link to the Cloudponics website and suggested this might be more what I was looking for: a truly turnkey pot growing solution. Although there are a small number of companies touting their automated grow boxes on Kickstarter and elsewhere, so far only Cloudponics had actually made it to market and they'd already launched their second iteration. I noticed that Cloudponics was utilizing Black Dog's full spectrum LED grow lights and my interest was immediately piqued. I watched their video--a nudge-nudge-wink-wink tutorial on growing your own hydroponic tomatoes (see below)--and I realized that this was exactly what I needed, I just didn't know it yet. 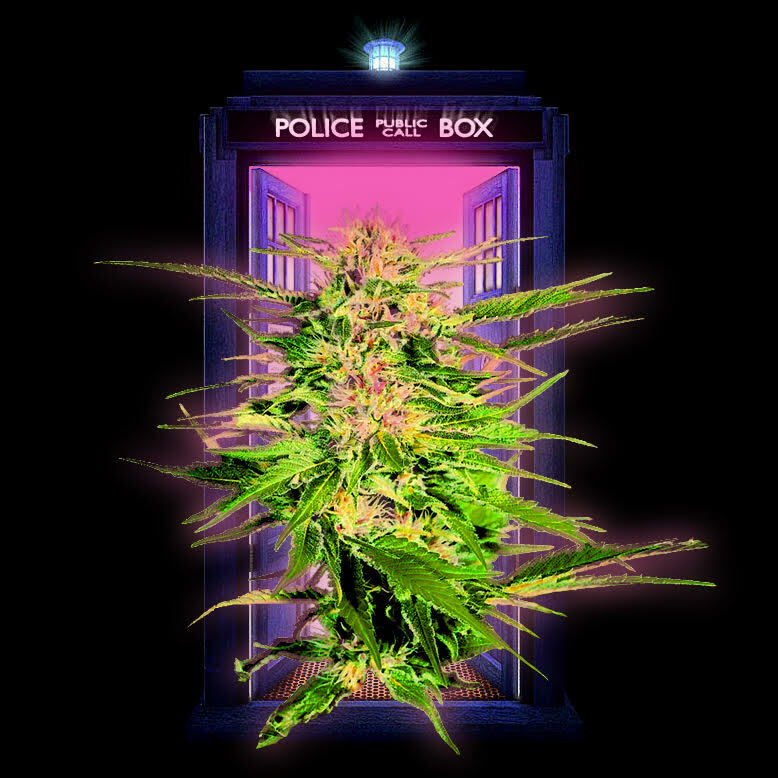 TO BE CONTINUED in Part 2 of 'This TARDIS Grows Weed With Artificial Intelligence'!